Mt. 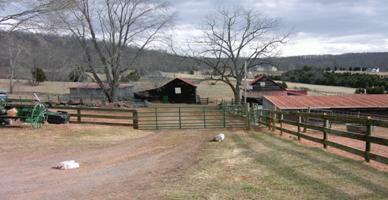 Airy Farm is a small farm located in the foothills of the Virginia Blue Ridge Mountains. We raise primarily Cormo and CVM Sheep, along with Angora Goats (Mohair) both colored and white. Agora Rabbits. These breeds are selected for their production of beautiful fleeces; for hand spinning and other luxurious fleece craft. Custom items such as: custom blends, handspun and hand knitted items, roving is available, raw fleece (it is best to reserve in advance) pelts are available and must be reserved in advance, or visit us at our shows. (see event calendar) All fleece are shorn by hand, limiting stress to the animals and second cuts. All whole animal sales are final. Yarn and wool Products are Guaranteed satisfaction. We also offer seasonal meat lamb and kid. The Farm also hosts Spring, grass fed steers, closely monitored and pastured fed, available with consignment and/or reservations.